Something’s afoot. The steward smiles at you like he has a secret, or like he thinks you have a secret, or like you think he thinks you have a secret. There are secret plots brewing, you’re sure of it. At the very least, there are yours. A passing servant murmurs, “The eggs are on the plate.” You frantically search your codebook for the translation before realizing he means that breakfast is ready. Excellent. Everything is going according to plan. Dominion: Intrigue is an expansion, and cannot be played by itself; to play with it, you need the Basic cards and rulebook (Dominion provides both). 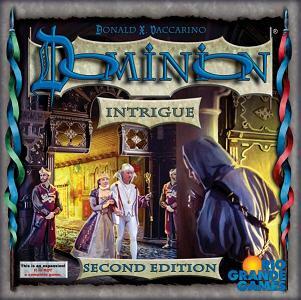 Dominion: Intrigue can also be combined with any other Dominion expansions you have. We hope you enjoy this expanding world of Dominion!